Bacho BE-9882s Insulated ERGO™ Screwdriver Set 5 for work on live equipment up to 1,000 volts. Permanent colour codes at both ends of the handle as a timesaving aid for application identification. 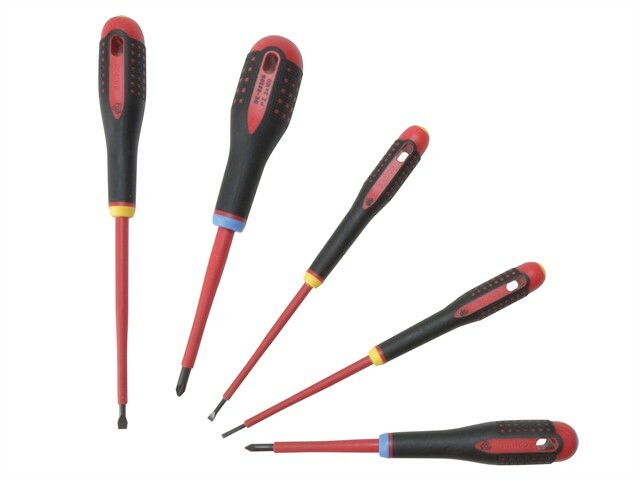 The screwdrivers have an ergonomically developed 3-component handle of polypropylene and thermoplastic elastomere. Conform to: IEC 60900, DIN -EN 60900, EN 60900,VDE 0682 part 201. 3 x Slotted: 3.0 x 100mm, 4.0 x 100mm & 5.5 x 125mm. 2 x Pozidriv: PZ1 x 80mm & PZ2 x 100mm.